Can you remember your house before kids? It was an entirely different space, right? Sure it was neat and tidy, but also too quiet and not nearly as much fun as your current kid-dominated dwelling. Everything changes once you have kids — from naps replacing fancy brunch as the ultimate indulgence to your TV-watching habits. But what most moms don’t know before they have kids is that the way to clean and take care of your house changes too. 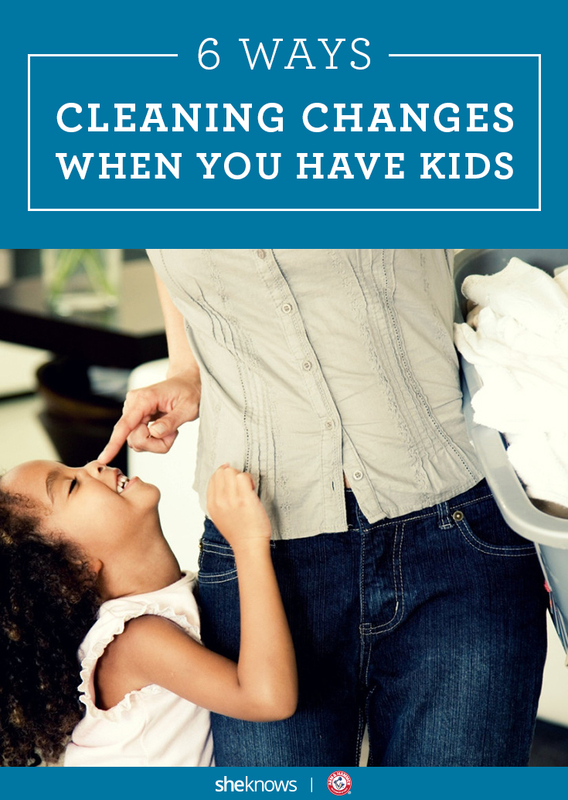 Here are a few ways house cleaning changes when you have kids in the house. Sure, before kids you prided yourself on museum-quality clean. But now that there are little people actively working against you having a perfectly tidy house, it’s time to get real. Neatly lined up rows of pillows have given way to bins full of toys and a clean floor is one that is relatively LEGO-free. Since you’re spending so much time and energy keeping those little buggers safe, it’s not surprising that most moms make the switch to natural cleaning products like ARM & HAMMER™ Super Washing Soda. Kiss those days of bleaching your surfaces goodbye because as moms know, everything those little hands touch will eventually go in their mouths. So let’s do our best to avoid harsh chemicals around the home, shall we? Once upon a time, the biggest mess you ever faced was probably from a spilled wine glass. These days, that’s nothing. You’re battling constant wars against upturned spaghetti plates, crayoned walls and chewing gum on sofa cushions. Now that you’re a mom, there’s always something to clean — and the next mess is always bigger than the last. You may not have realized it before you became a mom, but there’s a big difference between clean and tidy. Keeping things clean is more important than tidy when you have kids in the house. Piles of toys are just part of your life now, and you’re cool with that so long as the big stuff is done: clean bathrooms, kitchen and floors. A healthy home is more important to your kids’ well-being than neat-freak perfection, and no one knows that better than moms on the frontlines of housekeeping who are inevitably forced to pick their battles. As laid back as kids have made you about keeping the house clean, all that goes out the window as soon as the reality of guests coming to the house sets in. Many moms will overcorrect in this situation and spin into full “rage-clean” mode, which can quickly spiral out of control. Just remember, your guests aren’t coming over to critique your house, they’re coming over to visit with you — but the anxiety can be real. You’ve got this, Mom, and your house is perfect just the way it is. So go easy on yourself.